In my previous post I mentioned that Outline 4D (formerly known as StoryView) has become an integral part of my academic writing workflow, as my tool of choice for writing the first draft. O4D may sound like a surprising choice for this, and its emergence as such was unexpected for me as well. 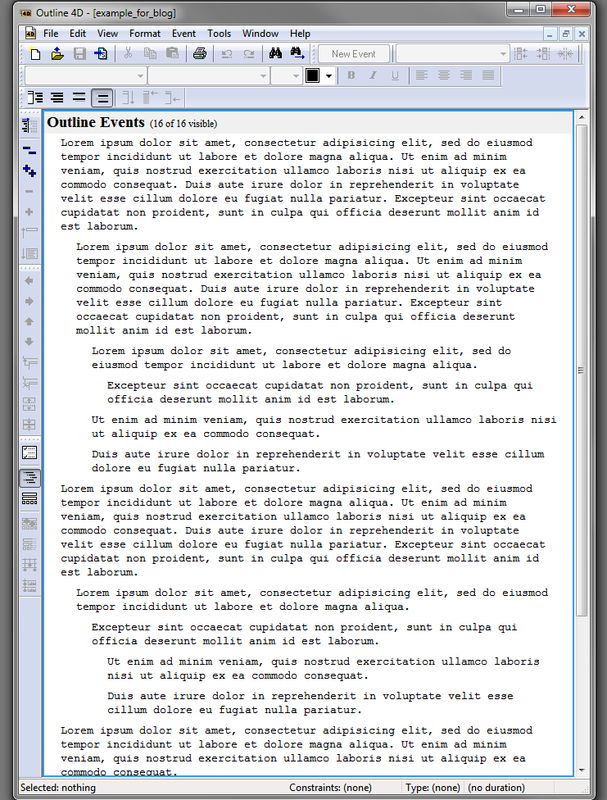 O4D is primarily known as a scriptwriting tool or an outliner targeting creative writers. It is quite old and it no longer seems to be developed. 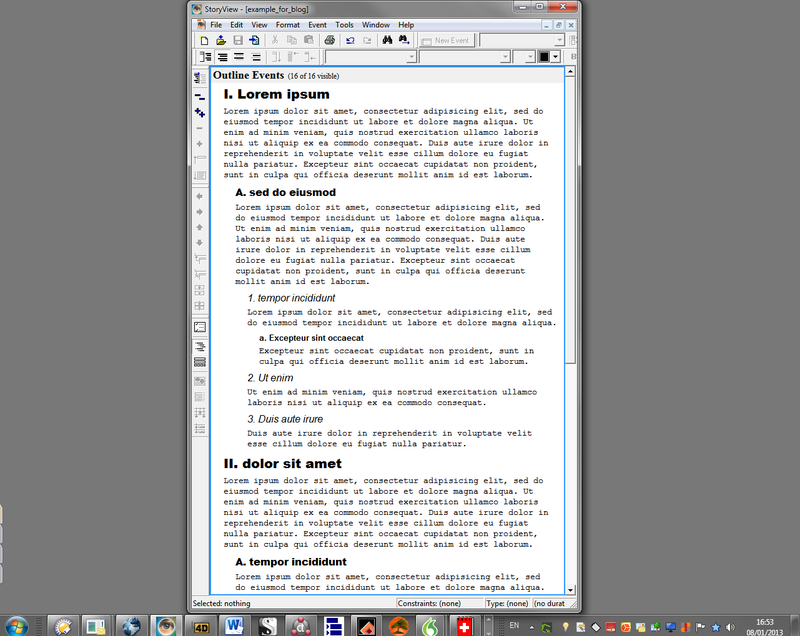 Originally I thought I would be using ConnectedText, Scrivener for Windows, MS Word 2010 or LibreOffice for writing up my PhD thesis. But through a trial and error process Outline 4D has emerged as the winner. 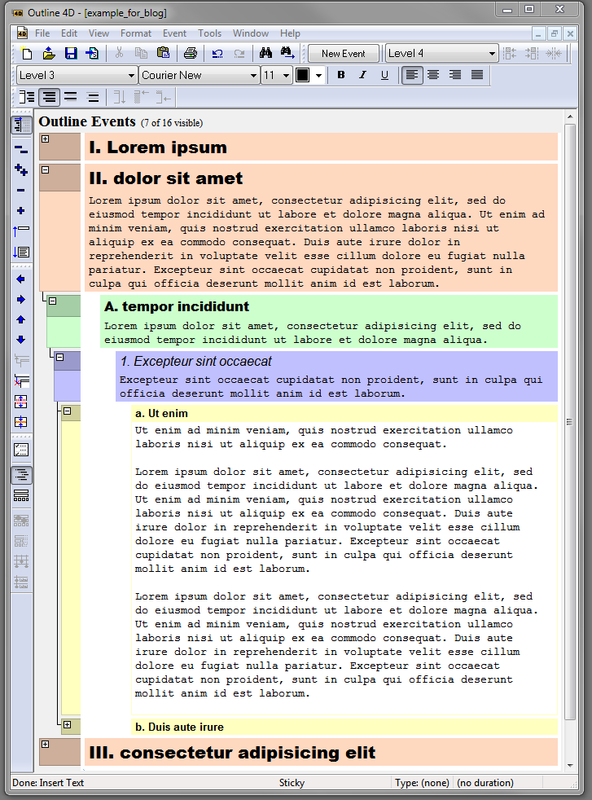 The main reason for this surprising development has to do with the fact that Outline 4D is a single-pane outliner with inline notes capability and with a wide range of visualisation options, which make it particularly suitable for both writing (as in developing sentences and paragraphs) and for reverse outlining (structuring the developing draft into a logical hierarchical structure). There are surprisingly few single-pane outliners with inline notes. I’ve tried them all and O4D is the most versatile in terms of visualisation and the speediest in terms of writing and reverse outlining operations. 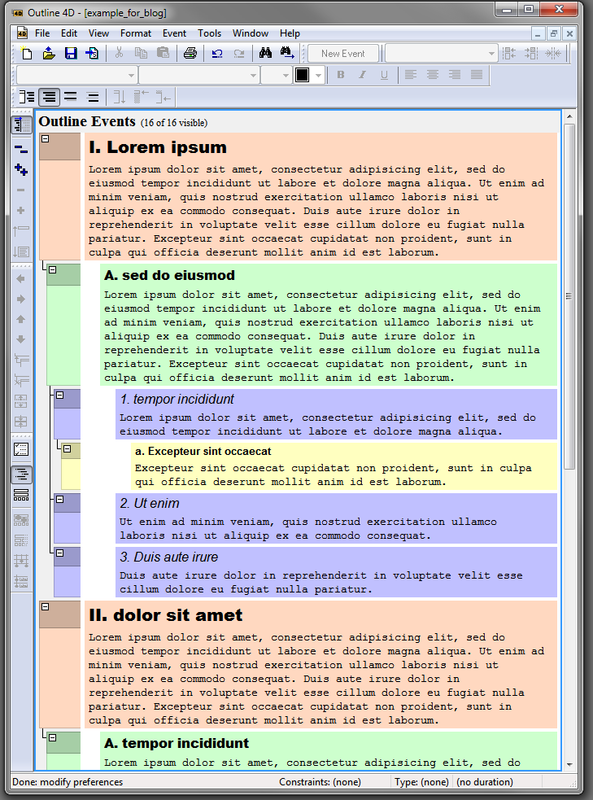 Why not use a dual-pane outliner and writing tool such as Scrivener or a word processor such as MS Word or LibreOffice with navigation pane enabled? 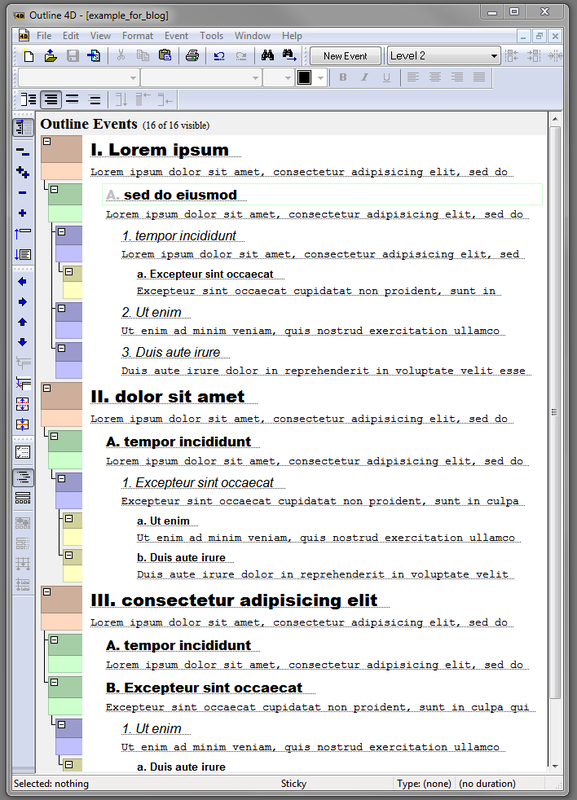 The main reason is that in a dual-pane tool you can’t just collapse and expand an arbitrary selection of sections and hierarchical levels to make only a particular part of the outline structure visible and still be able to work on a section of your choice for which that particular view is relevant. Also, it’s just more helpful to be able to view the “headings” (“titles” in O4D) within the same pane, rather than have to look for them in a second pane. I will provide a screenshot below to illustrate how this is done in Outline 4D. Before I get to that one though, let me just walk you through the main options for visualising your developing draft in O4D. First, let’s take a look at the plainest view. You have a classical single-pane outliner with inline notes here. 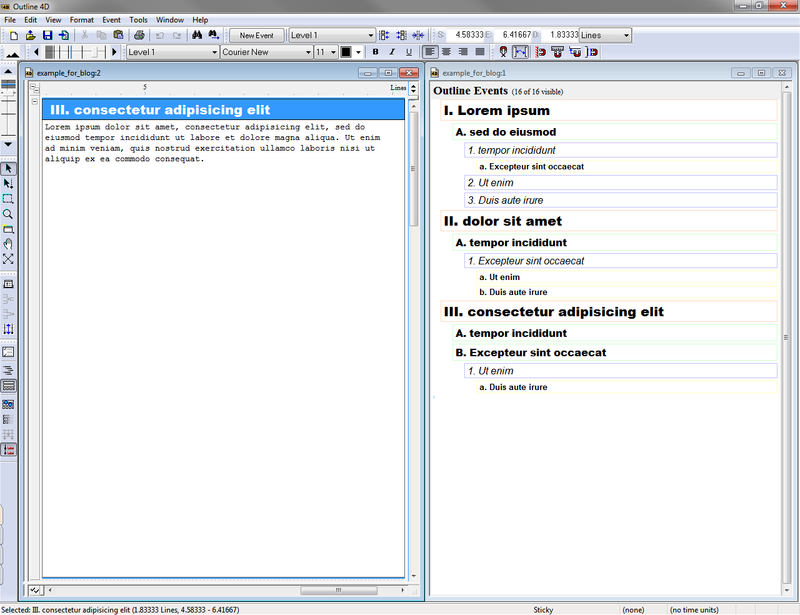 O4D allows you to customise the font and the background of each hierarchical level of the text. 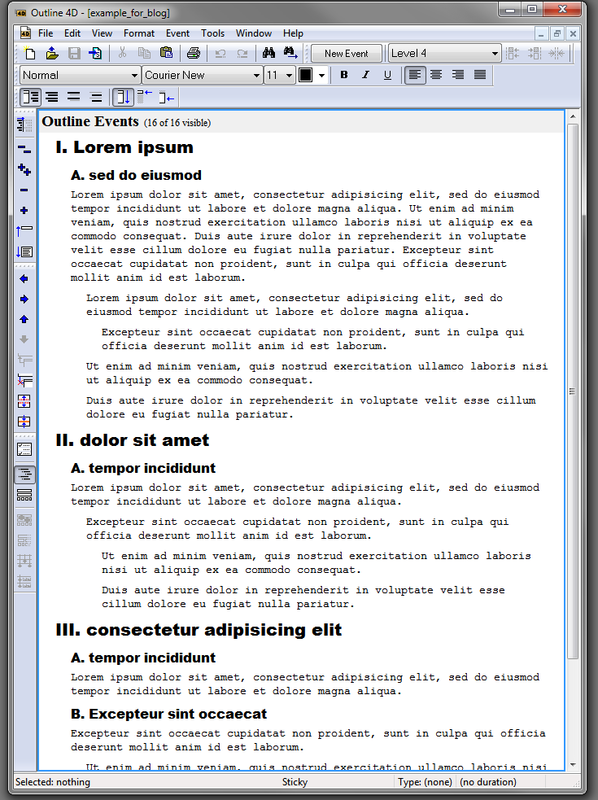 Each outline item or text snippet (called “event” in O4D, reflecting its scriptwriting origins) consists of a title and the inline note (called “content”). Both are optional, i.e. you don’t need to have a title if you don’t need one, and you don’t need to add content to the title if you don’t want to. This text can be viewed (in the main “Outline View,” as opposed to the “Timeline View,” which I’m not going to discuss here) in four different ways, which I find extremely helpful. The first one can be seen in the screenshot above, which shows both “Titles and Content (Ctrl+Shift+8).” This is the most complete view, i.e. all the textual content is visible. If this was not enough flexibility for viewing your content in different ways, there is still the “Custom Visibility (Ctrl+Shift+7)” option. It allows you to individually customise every single item (title + content, which for me equals a paragraph and its topic) in your document, so you can hide for example meta commentary that is not strictly part of your text. The beauty of O4D is that these views are not just there for visualising the text differently on your screen but you can also print or export your text as an RTF file in the selected view. 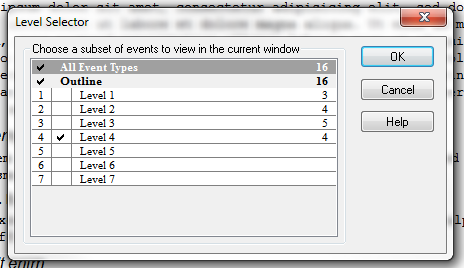 Even the word count tool allows you to exclude event titles or only include selected “events” (outline items). Here is an example of a custom view. I hid the contents for level 1 titles and I hid the titles for level 3 and 4 content. I haven’t used this feature yet for my current project but I could see it becoming useful once large texts become available and let’s say I’d only like to see the Level 1 text, which would be all the introductions to various sections, thus giving a quick overview of the overall project, allowing me to check for logical consistency, ease of comprehension and transition between sections. 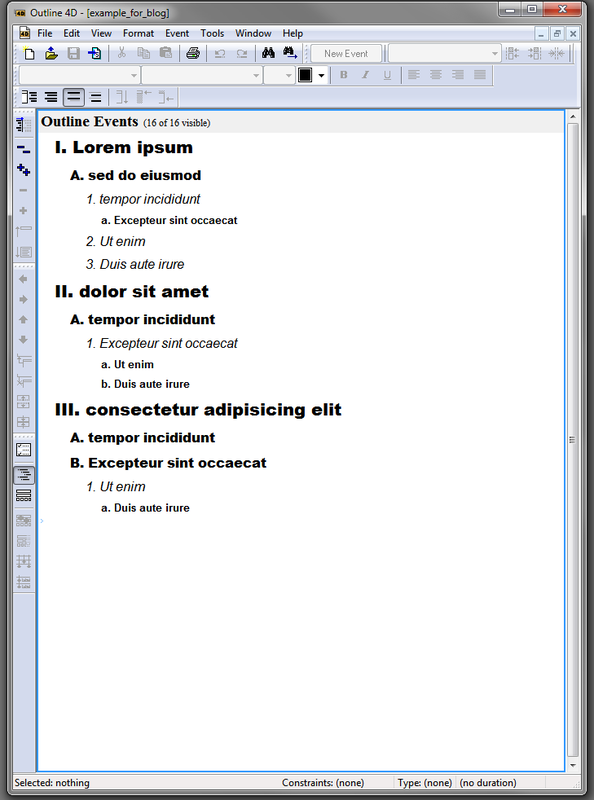 Personally I don’t use this feature in O4D, as I find it too busy for viewing inline notes (although I use it a lot in Bonsai for a regular outline without inline notes). Instead, I prefer to colour in the background of the outline items. There are several options for that. Similarly to the font colour, you can customise background colour per hierarchical level (but there are other options as well). It depends on the stage of the writing and the particular writing or editing task whether I opt for a distraction-free all-white background or I turn on a partial or full background-coloured view. 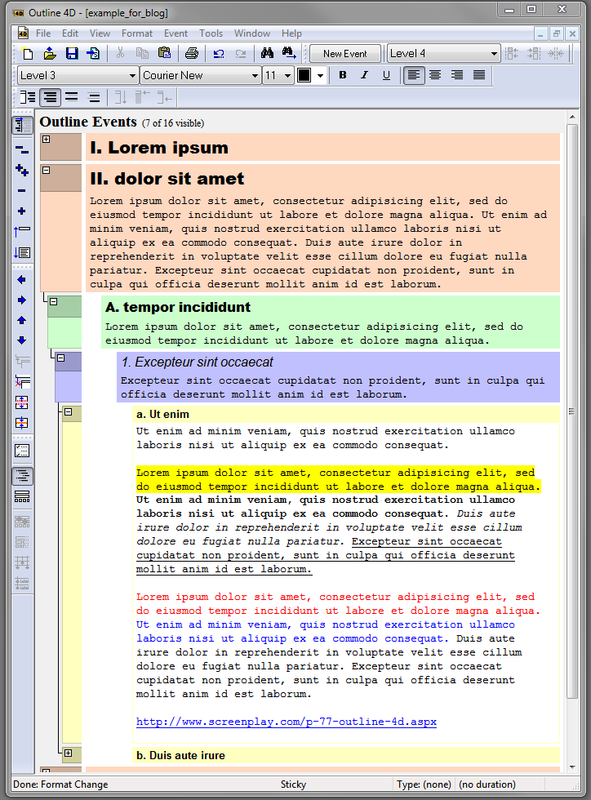 Here is a screenshot I promised at the beginning of this post to illustrate why I find O4D better for reverse outlining than dual-pane outline setups like Scrivener, WhizFolders or MS Word 2010 with navigation pane. Here I collapsed Part I and Part III completely, so I can focus on Part II. Even within Part II, I can selectively collapse or expand particular sections, depending on whether I need to see them during the writing process. Here I’m working on the section entitled “Ut enim.” You can see that the body of the active section has a white background, which makes it easier to see where you are and also to indicate that work is being done here. I have written three paragraphs already, so the next step would be to do the “reverse outlining,” which would involve splitting off these paragraphs into their independent sections, giving them a title that summarises them, and indenting or outdenting them according to how they fit into the overall train of thought logically. 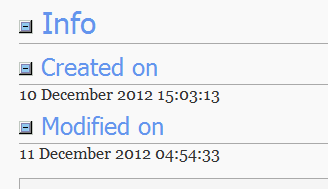 Finally, it is also possible to mark up the inline text with a limited selection of rich text formatting. There is yellow highlighting only, bold, italics, underlining, and you can also change the font colour further. It is possible to designate URLs and email addresses as such, but they would only become functional after the text has been exported as RTF. I don’t tend to bother much with formatting my text because here I want to concentrate on writing, not on word processing. Outline 4D is not compatible with citation software either but that doesn’t bother me, as I find using EndNote referencing during writing distracting anyway. Instead, I just type my references manually such as (Smith 2010: 345), and then I replace them with EndNote references once I’ve exported the completed draft into Word. The downside of MDI is that you can only run one instance of O4D, which makes it a bit awkward (but not impossible) to view a set of O4D documents in one monitor and write another O4D document in another monitor. I get around this restriction by doing the writing in StoryView, which is an earlier (and 99% identical) version of O4D. If you decide to buy O4D, it’s worth asking the developer or the retailer whether they can also give you a licence for StoryView. I hope I have managed to demonstrate why I think Outline 4D is an excellent writing environment for drafting and reverse outlining. As I mentioned it in my previous post, this stage for me comes after the note-taking and outlining stage, for which I prefer to use ConnectedText and Freeplane. 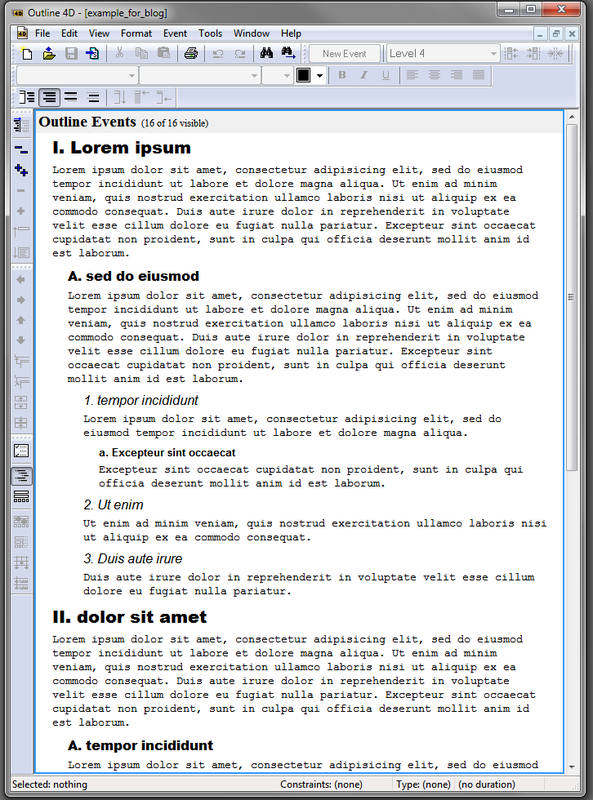 The next step would be to export the Outline 4D document as an RTF file, convert it into a .docx file in Word, add my EndNote references, convert the O4D headings into Word headings in order to produce a table of contents, and add any further rich text formatting necessary (which would mostly consist of adding italics for emphasis). Then it’s off to the printer. If you decide to give Outline 4D a try on a Windows 7 machine, make sure to run it in Windows XP mode and as an administrator (right-click on icon, choose “Properties” and click on “Compatibility” tab). Even then I needed to disable “User Account Control” (UAC), to stop the annoying Windows pop-up. I did come across one bug: it crashes sometimes if you change some options in the “Outline 4D Options” window while in “Timeline View.” So make sure to save your work before changing those options. Having said that, I haven’t lost any work in O4D so far. But I do save my work often (there is even an automatic reminder you can set to save after a given period) and export it into RTF daily, just to be on the safe side. It’s an old piece of software after all. I’ve just realised that there is yet another relevant view of the outline that I forgot to add. 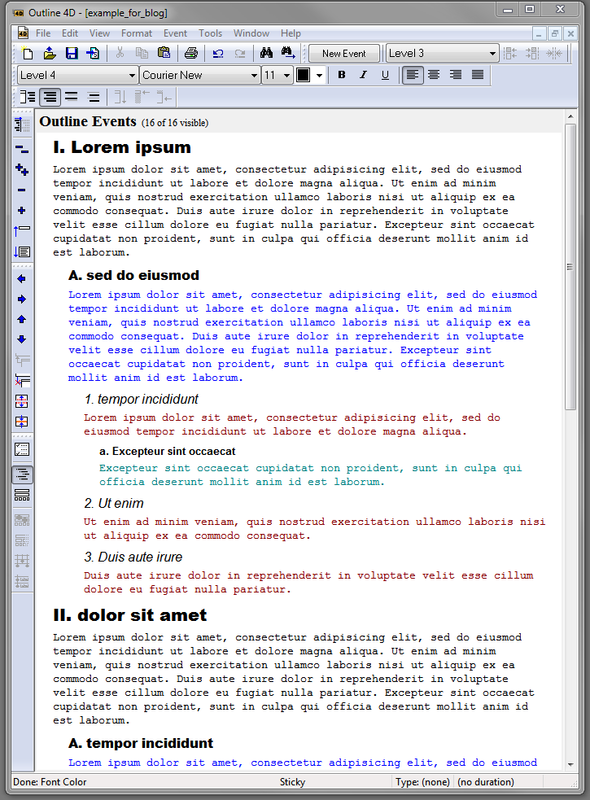 If you select all items and click the “Summarize (Ctrl+[)” button, Outline 4D provides you with a summary view of your outline, consisting of all the titles and the first line of each content section. 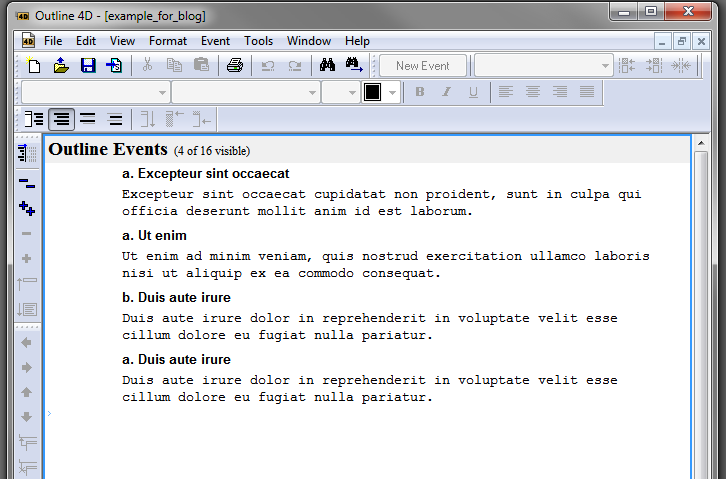 There is also an “Unsummarize (Ctrl+])” button to revert to the full outline. This summary view is an interim step between the “Titles Only (Ctrl+Shift+9)” view and the “Titles and Content (Ctrl+Shift+8)” view. 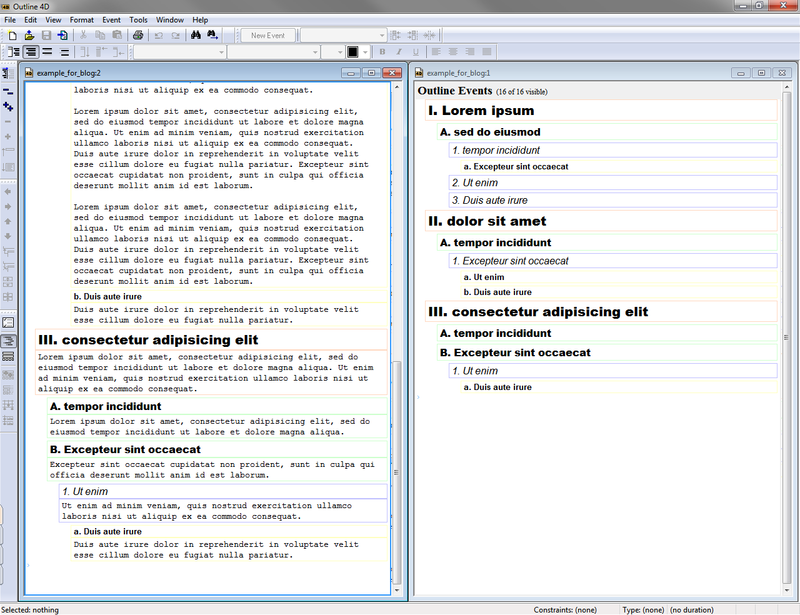 It can be useful for skimming your document and getting an overview of the general flow and coherence of the text. Of course there is still the “Timeline View,” but that is such a complex feature that it would take several blog posts to do justice to it. It’s like having yet another completely different piece of software, although it is intrinsically linked to the “Outline View” in some very ingenious ways. Hats off to the original developers, wherever they may be! P.S. Although above I linked to the developers’ (Write Brothers) website, where you can download a 5-day trial version, if you are interested in purchasing this software, it is worth shopping around. E.g. currently the download version is $89.95 at Screenplay.com, while at the Writers Store it is $79.00. But occasionally you can get it even cheaper from Amazon (the boxed version) or from small retailers outside the US, or if you catch a promotion at Screenplay.com (it was $65.00 back in November 2012). P.S. In fact this feature can turn O4D from a single-pane outliner into a dual- or even multi-pane outliner. 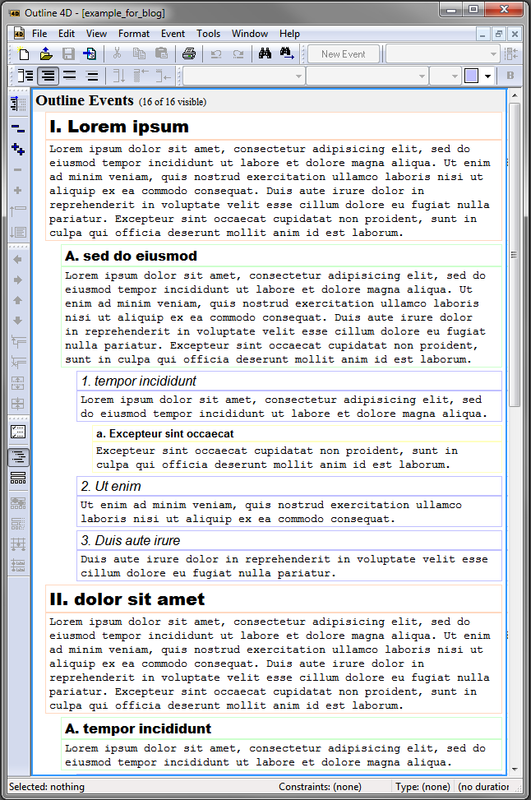 You could have a top-level outline open in the left pane, a more detailed outline in the next pane to the right, and then the single-note (document) view in a third pane (which would make it into a three-pane outliner). P.P.S. 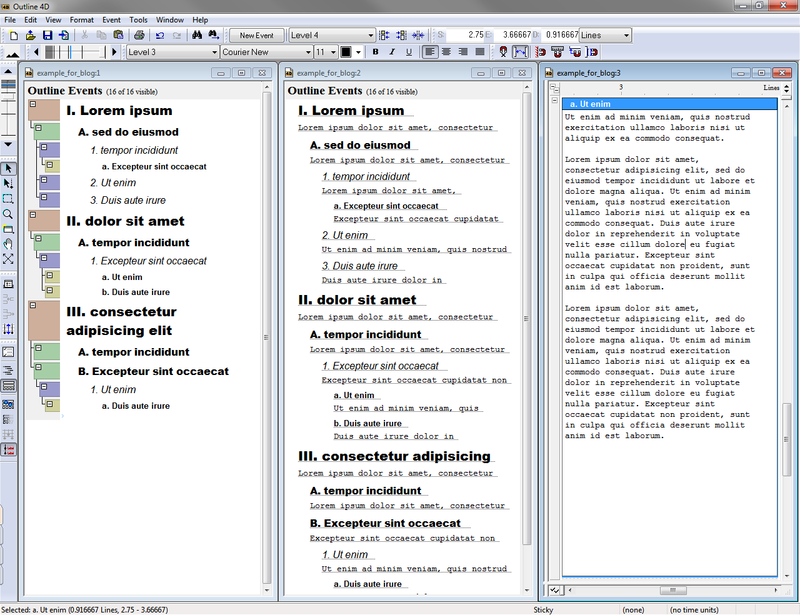 Here is a screenshot of Outline 4D as a three-pane outliner. 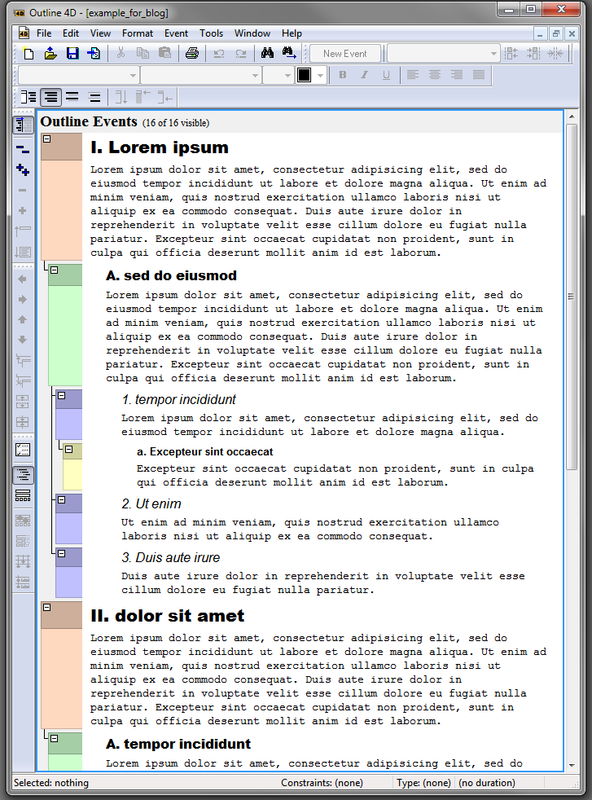 The left pane is “Titles only” view; the middle pane is “Summary” view with first line of content showing, and the right pane is in “Timeline view” with “Fit to view (Ctrl+3)” on, only showing one item in focus. I’ve added two new headings to my ConnectedText template for my reading notes database. This is for pasting in the full text of a publication. I mostly use this for blog posts or other online articles that I don’t have a PDF for, as these could disappear or be modified any time. I could have printed them as PDF and linked them to EndNote or added them to my web clippings in Surfulater instead; however, I might forget about them that way. As these are important to read, I can link these topics to my Project Outline in CT, as to-dos. I could even mark the relevant topics with full text with a different icon in the Topic List window to remind myself to read them later. Why is it important to know when a reading note was created and last modified? It is not all that important at the time when you are first working on it. But once you have hundreds or even thousands of notes in your database, you may get into a situation when it comes in handy to know when you had read a particular article or book in your academic career or during your research project. For citations of blog posts and other online articles, the “created on” date can also serve as the “date accessed” for your bibliographic reference. In my previous post I discussed how I turned to writing as a way to put a stop to my obsessive-compulsive outlining behaviour. Outlining is certainly an important part of preparing for writing, but not if outlines keep on begetting further outlines and there is no end in sight to the proliferation of outlines. The white space of the empty Word document acted as a laboratory or workshop where I could cobble together the various conceptual threads, while still keeping a reverse outline to monitor the emerging shape of the argument. This strategy worked fairly well for a while, and I ended up with about 3000 words that I’m reasonably happy with. Then I got stuck. Now, I’m sure lots of things have been written about the writer’s block, and I don’t have time to read any of it. So apologies if I’m stating the obvious. But I’ve been finding that there are usually two reasons why I get stuck: either I haven’t worked out the content of what I’m going to say (the conceptual point) or I haven’t worked out in sufficient detail the practical steps (workflow) that I need to take. The two reasons are closely interrelated because usually I need to work out the practical steps to be able to develop the conceptual points. At this stage of the game however I couldn’t fathom developing yet another linear outline in a traditional one-pane or two-pane outliner to work out the next steps. One reason why I’m finding linear outlines less helpful towards the end of my project is that this stage requires synthesis, which is about putting things back together, rather than laying them out in a line (out-line). Synthesis requires matrix-type tools, as there are at least two “dimensions” that need to be brought together (if we consider a linear outliner a one-dimensional tool). There are a number of ways to create such a matrix effect. 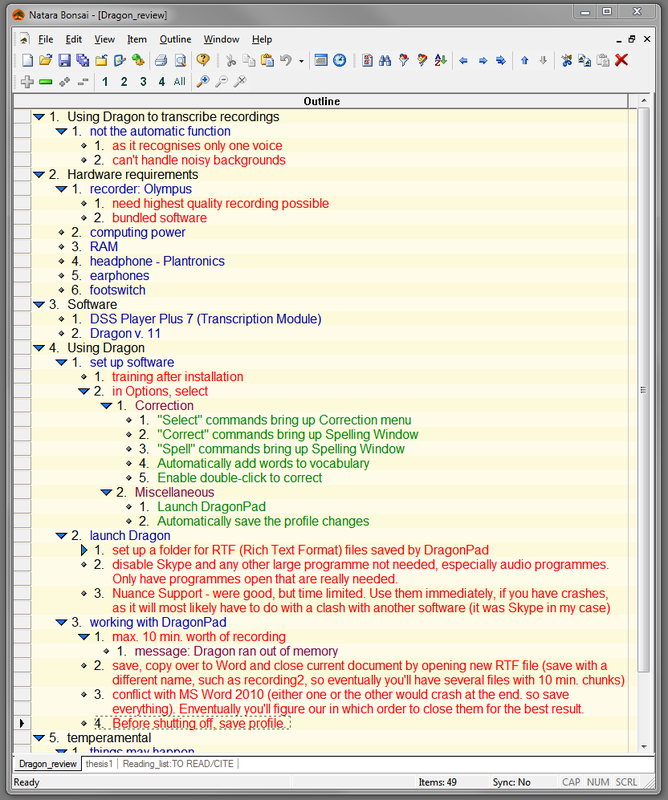 One could just use a table (Word) or a spreadsheet (Excel) or columns in a one- (Bonsai) or two-pane (myInfo) outliner. I particularly like to use TreeSheets for this type of matrix-outlining. However, this time I reached for my favourite concept mapper, VUE, again, as it was a lopsided matrix that I had in mind, where one axis had a lot more content than the other and I needed the ability to visualise the shape of the whole thing, no matter what size it grew to. The matrix is constituted by the analytical lens on the right-hand side (grey nodes), which was applied to evaluating the rest of the nodes. When I started the mapping and review process, I thought I only had three sub-topics to write about. Conceptual development occurred as part of this mapping process, and I ended up discovering that I had three more important things to say. Finally at the bottom I drew some conclusions from the material. The advantage of doing this in VUE (as opposed to a traditional one- or two-pane outliner) was that I didn’t need to worry too much about an overall hierarchy initially. 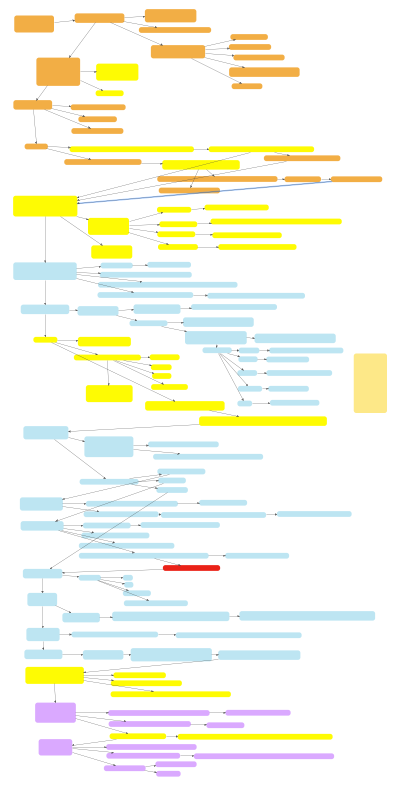 Any node can be linked to any other node, and while there is a certain hierarchy here (the overall argument flows from top to bottom, and section arguments flow from left to right and down), working in a concept map feels more fluid and free than in a linear outline. It is just a matter of different visualisation, as all of this could have been done in an adequately equipped one-pane outliner as well. So what are the next steps? Now that I know what I want to say in this part of my chapter, I can write an introduction that will state what is going to be said, with a thesis sentence that combines the topic sentences of the six sections and points towards the contributions that will be summarised in the conclusions. My plan is to keep this concept map open in my second monitor and use it as a guide while I dictate my text into Word with Dragon.